The National Safety Council and the Network of Employers for Traffic Safety (NETS) invite employers to participate in Distracted Driving Awareness Month in April. Both groups are offering free employer resources, including posters, fact sheets, infographics, social media posts and more. Sharing this key information with your employers will help protect your workforce – and your business. Safe driving requires drivers to frequently scan the area around them and react quickly to changing situations. Distracted driving affects their ability to perform these tasks. In 2015, 3,477 people died in crashes involving distracted drivers and 14% of these crashes were reported to have involved cell phone use as a distraction. However, since police reports mainly depend on information provided by drivers at the scene, crashes attributed to all types of distracted driving are thought to be well underreported. The National Safety Council estimated that 27% of all traffic crashes in 2013 involved the use of hand-held or hands-free cell phones. Avoid temptation to talk or text on your phone. Turn it off while driving or place your device in the glove box or center console so it’s out of sight and out of mind. Vary your route when possible, so routine trips like commuting to and from work don’t become mundane. Keep your eyes moving. Make a full mirror sweep with your eyes every 5-6 seconds to stay alert and ward off allowing your mind to wander. Keep a safe following distance. Driver training experts suggest a following distance of 3-4 seconds in good weather – more in inclement weather. The 3-4-second following rule increases visibility and gives more time to react to what’s happening in front of you, reducing risk to you and your passengers. Clear your mind. You cannot focus on driving if your mind is on work or family pressure or your to-do list. Take a moment before you drive to get your mind focused on the task at hand – getting to your destination safely. National Safety Council Distracted Driving Materials. Browse transportation safety signs and labels. 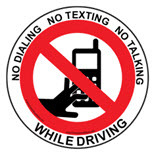 Use this bold NO DIALING NO TEXTING NO TALKING WHILE DRIVING label with the universal Prohibited graphic to clearly send your Cell Phone / Texting message to employees and visitors.